1/3 cup (or less?) brown sugar – depends on how sweet your berries are. Cut the cold butter into the sifted flour, sugar and salt until crumbly. You can either use a pastry cutter or a stand mixer on low (with the paddle attachment), or even a fork or two knives. Add the freezing cold water a little at a time until the dough is wet enough. It shouldn’t be sticky but should hold together. Kneed just a few seconds to bring it together, then divide into two round flat rounds and place in the freezer for 15 minutes. While the dough is freezing, wash the blueberries and add to a bowl. Add the lemon juice, brown sugar, flour (or cornstarch), and salt. Mix. Heat your oven to 375°F (190°C) and take one dough round out of the freezer. Flour your counter, the dough and the rolling pin and roll until about 11″ across. Place over your 9″ pie pan and pat down well. Trim the edges and place back in the freezer. Take out the remaining dough round. 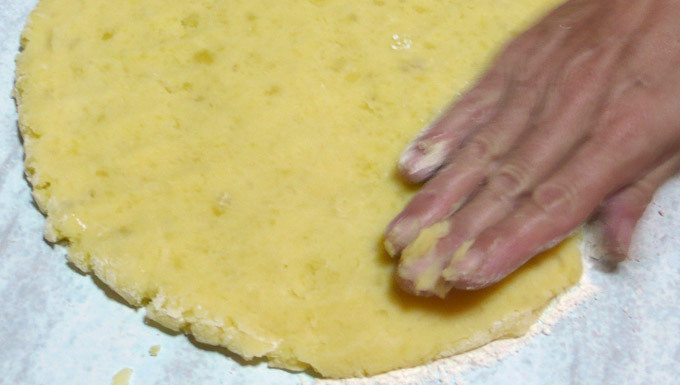 Roll out this dough into more of a rectangle to about the same thickness as your previous dough. Cut into long strips about 1″ (2cm) wide. I to use a zig-zag pastry cutter for a nice edge, but you can use a butter knife too. 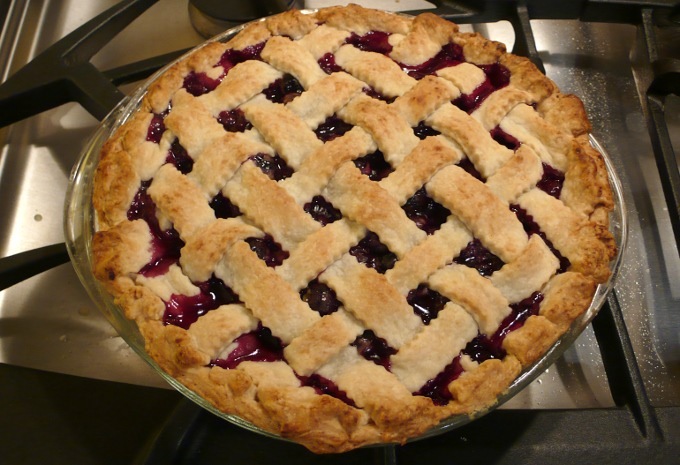 Remove your pie crust from the freezer and fill with the blueberries. Now we’ll make the lattice top. Place strips across the top in one direction only. Fold every other one back at the half way point. Place one strip across and bring all the strips back down. Fold the other half of the strips up and repeat. When you get to the end of the pie, turn it to do the other half. Fold the strips under the first crust and crimp the edges. Bake for 50-55 minutes or until the filling is thick and bubbling and the crust is browned. I recommend placing a cookie sheet under the pie in case it leaks. Add the water, milk, sugar and butter to a saucepan and heat until butter has melted. Do not boil. Allow to cool until warm. Add the yeast and cover for about 5 minutes, or until bubbly. When doubled, mix with a spoon to knock it down. 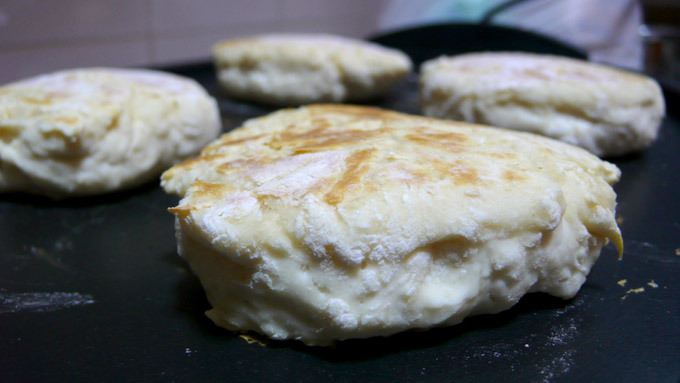 Fill greased biscuit rings about 1/2 way with the batter and cook on a skillet over medium low heat until the tops are not shiny, the bubbles have popped, and the bottoms are browned. Makes 6. Toast before eating (don’t cut in half like an english muffin, just throw the whole thing in the toaster as-is). Serve with butter and jam or Marmite. They freeze well. And don’t forget the tea! This is Patsy. She’s from Belfast, Northern Ireland. She teaches swimming at a school in Rayong, Thailand. She also bakes for a lot of the local restaurants in the area. I tried her soda bread and kindly asked if she would show me how to bake it. 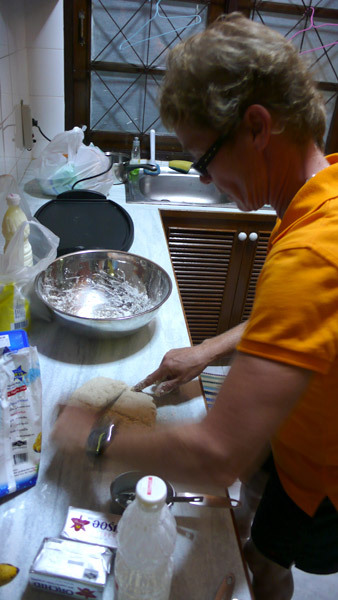 She came over, showed me soda bread, potato bread and how to make a kiwi pavlova! Very exciting indeed. She’s even sent over the recipes she uses which I’ve posted here along with some photos from our baking day. Anything in italics are my notes for American readers. This bread is popular throughout Ireland. Because it is easily and quickly made it is often baked fresh for tea or even breakfast. At home we used to call the loaf made with white flour soda bread, while that made with wholemeal (whole wheat flour) was wheaten bread. In other parts of the country wheaten bread is referred to as brown soda or, confusingly, soda bread! Sieve (sift) the dry ingredients into a large bowl. Scoop up handfuls and allow to drop back into the bowl to aerate the mixture. Add enough buttermilk to make a soft dough. Now work quickly as the buttermilk and soda are already reacting. Knead the dough lightly – too much handling will toughen it, while too little means it won’t rise properly. Wheaten bread or brown soda is made in exactly the same way but with wholemeal (whole wheat) flour replacing all or some of the white flour; this mixture will probably require less buttermilk. Another variation is to add 1/2 cup of sultanas (raisins) to the white bread. Note from Cee: Patsy says there are two ways of cooking soda bread – in the oven as in the above recipe, or on a griddle. She said she cooks it on a griddle most often and that’s how she showed me how to do it (see photo above). If cooking on a griddle, separate above dough into four rounds and flatten on a well floured surface to about 1/2″ thick. Score a cross into it and cook on medium heat for about 5 minutes on each side. Press the sides to check doneness – it should spring back. Once cooked, you can snap apart at the scores and have 4 triangle shaped soda breads called “farls”. She also used more baking soda than in this recipe, about 3x as much, perhaps due to the humidity in Thailand to help it rise. She does not add sugar. The recipe calls for cooked, mashed potatoes. These should be freshly boiled, or, better still, steamed and passed through a food mill, and used warm. Melt the butter and mix into the potatoes with the salt. Work in the flour quickly but thoroughly and knead lightly. Divide in two and roll out each half on a floured board to form a circle about the size of a large dinner plate. Cut in quarters (farls) and cook for about 3 minutes on each side in a heavy frying pan in a little bacon fat. Note from Cee: Patsy says to make potato bread is quite easy, you don’t really need to measure anything. Simply take as many potatoes as you like and boil them until really soft. Make mashed potatoes like you do normally with butter and salt, but make sure they’re really well mashed and not lumpy. Add a wee bit of flour and mix. She did not use as much flour as the recipe above. 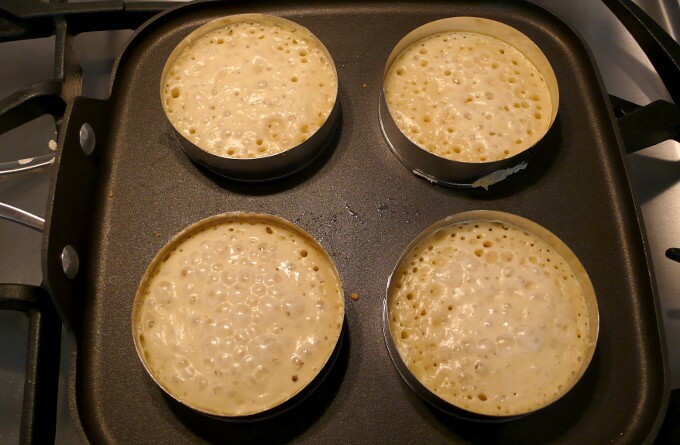 Turn out onto a well floured surface and pat into a pancake 1/2″ thick. Cut into quarters (farls) and fry on a medium griddle until light brown. She used one of those non-stick electric griddles which doesn’t require grease. Morning coffee and afternoon tea would not be complete without fresh scones, and there are so many delicious varieties. The secret of making good scones is a quick, light hand when mixing, and a hot oven. Preheat oven to gas mark 8 / 230°C / 450°F. Sift flour with salt and rub in butter or margarine. Make a well in the centre and pour in the egg and most of the buttermilk. Mix quickly to form a soft dough, adding a little extra buttermilk if necessary. Turn out onto a floured surface and roll out lightly until 2.5cm / 1 inch in thickness. Working quickly, cut into 5cm / 2 inch rounds. Glaze with egg or milk and set on a floured baking sheet. Bake for 15-20 minutes until light brown. Add 1 teaspoon dry mustard, 50g / 2oz grated cheese and 2 tbsp fresh, chopped herbs to the dry ingredients and proceed as before. 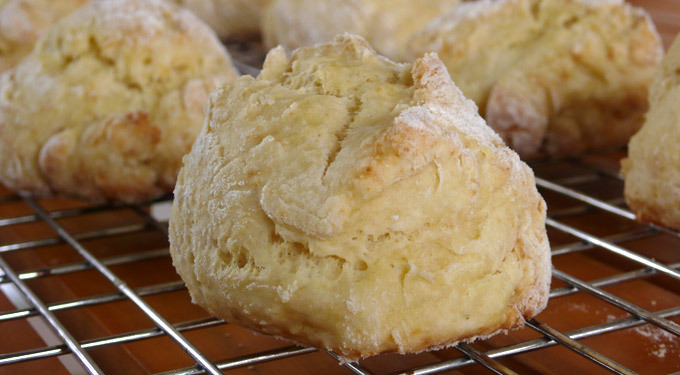 After brushing with egg or milk, scatter a little grated cheese on the top of each scone. Did you treat your Mary Ann to some dulse and yellowman, At the Auld Lammas Fair in Ballycastle-O? Dulse is a purple edible seaweed. I remember buying it at a penny a bag as a child when sweets were hard to get at. It can also be stewed for a couple of hours and eaten as a vegetable or with oatcakes. It is not known much outside the north of Ireland – and it is no great loss! Yellowman is a different matter all together. This toothsome, honeycombed, sticky toffee is traditionally sold at the Auld Lammas Fair at the end of August. The “Irishness” of this lovely chocolate cake is thanks not only to the wonderful liqueur used in the filling, but also to a certain, very Irish, ingredient in the cake mixture itself, which contributes to its moistness. Preheat oven to gas mark 5 / 190°C / 375°F, and grease and line two 20cm / 8 inch cake tins. Sift flour and salt into a mixing bowl. Melt chocolate in a bowl placed over a saucepan of hot water. In a separate bowl, cream butter and sugar together until fluffy, then beat in the chocolate and mashed potato. Gradually beat in the eggs, adding a little flour with each addition. Fold in the rest of the flour and stir in the milk. Heavily grease with butter some ramekins… about 8 of them. I cheated and used a muffin tin. Worked fine. Remove the black inner seeds from the cardamom pods and discard the shells. Add to a mortar and pestle along with the cloves and peppercorns and grind until fine. Melt the chocolate & butter with the spices over medium low heat with a bain marie until melted. While the chocolate is melting, beat the eggs, sugar and salt until the sugar dissolves. Then add the flour and mix well. Add the melted chocolate into the egg mixture. Stir then fill the ramekins or muffin tin almost to the top. Bake for about 8 minutes, until the top is dry and puffs up, but is still a bit jiggly if you move it around in the oven. Remove from oven and let set for a minute or so, then flip onto a plate and top with powdered sugar. I added the sugar inside a tea strainer and tapped the side of it with a spoon on top. Wash the eggs well and boil in a small pot with about 1/2″ of water covering them. After a few minutes, remove the eggs and cool in a bowl of cold water. When not so hot anymore, tap the shells with the back of a spoon until completely cracked all the way around, then add back to the boiling water with the rest of the ingredients. Simmer on very low heat for about 30 min, then let sit for a few hours or overnight. In large bowl, beat butter, sugar, eggs, and vanilla until light and fluffy. Combine the flour, cocoa, baking soda, and salt; stir into the butter mixture until well blended. Mix in the chocolate chips. Divide into 24 equal round balls and place on a baking sheet. I usually cringe when people talk about fusion food, but recently I had a Thai interpretation of Bánh Xèo (usually called Vietnamese Pancake or Vietnamese Crêpe in English) at a temple fair in Bangkok. It was served by two ladies who simply called it “khanom buang yuan” (Vietnamese pancake). It was very unlike it’s Vietnamese cousin, but was really really tasty. I liked it so much I went home and made it the next day. The only thing I changed from their version was to serve the pancake folded once (like in Vietnam) and I added turmeric powder to the dough (Jett’s idea). It’s filled with cooked bean sprouts, fried tofu, pickled radish and chopped peanuts. And topped with ajaat — slightly pickled cucumber salad. It’s like Southern Thailand meets Southern Vietnam! Mix the rice flour, water, egg, salt and turmeric in a bowl until smooth. Be careful with the turmeric, it stains really really well. Fry the tofu strips until crispy, about 2-3 minutes on high. Set aside. Boil the bean sprouts until soft, but not dead. About 30 seconds. Chop the Chinese pickled radish (chai bo) into little pieces. If you don’t have chopped peanuts, go ahead and do that too (if you have a mortar and pestle, it’s way easier to use that. Use a large bottomed pan (crepe pan is good) and bring it up to medium high to high heat. Coat the bottom of the pan with a bit of oil. When hot, add 1/2 of the batter and lift the pan — tilt it to coat the bottom. Set it back down and let it cook for about 1 minute, or until the bottom is lightly browned. Flip and add 1/2 of the filling ingredients. Fold in 1/2 and toss on a plate. Repeat once more with the rest of the ingredients. Top with the cucumber salad and chopped peanuts. If you leave out the pickled radish, make sure to add some salt, as the radish is where most of the salt comes from in this dish. I’m not kidding about the turmeric, if you like your counter tops or don’t want yellow hands for a week – be careful. You can substitute the fried tofu with whatever you want — don’t be afraid to get creative. Here’s the recipe I use for hummus — I’ve made it a few times now and it’s pretty good. And really easy. I can’t find the original site where I got the recipe from, otherwise I’d credit it. Soak the chickpeas overnight in water. Make sure you cover them with a lot of water because they’ll triple in size. Rinse the soaked chickpeas well and drain. Put them in a saucepan and cover with plenty of fresh water and 1/2 teaspoon salt. Bring to a boil. Skim off the scum that forms at the beginning, then cover and cook over medium heat for about 1 1/2-2 hours until the chickpeas are very soft. You’ll probably need to keep adding water and skimming the scum off the surface. Allow to cool. When the chickpeas are done, puree the garlic and the rest of the salt in a food processor. Add the tahini and lemon juice and puree until blended. Add 1/2 cup of the chickpea water and process until completely smooth. Fish out the chickpeas and add them to the food processor, but keep the chickpea water. You may want to keep a few aside as garnish for after. Process until well-blended. Thin to desired consistency with the chickpea water. Adjust the seasoning with salt and lemon juice. The hummus can be kept in an airtight container in the fridge, and it’ll last a few days up to a week. Serve sprinkled with paprika and extra virgin olive oil. Goes great with homemade pita. Cream the butter until smooth, and gradually add the sugar. Beat for 2-3 minutes until it’s fluffy. Add eggs one at a time, and beat well between. Combine the dry ingredients — flour, baking soda, baking powder and salt in a bowl. Add slowly to the creamed butter mixture. When mixed, add the lime juice and zest. Fill lined cupcake tins 3/4 way, and bake in a pre-heated oven for 20 minutes at 350°F. Make sure the tops do not get browned. Cream butter until smooth, and then add the milk and lime juice and mix well. Slowly add the sugar until the desired consistancy is reached — you may not need all the sugar. You can add food coloring and/or zest if desired. Make sure the cupcakes are room temp before icing or you’ll make a big mess. Top with sprinkles or whatever you want! Mix the white sugar, tablespoon of flour and cinnamon together, then sprinkle on the apples. Pour water evenly over the top after. Mix the oats, flour, brown sugar, baking powder, baking soda, and melted butter together. It should be really thick. Crumble with a spoon over the top of the apples, making sure it’s evenly covered. Bake at 350°F (170°C) for 45 min or until dark brown.